Architectural use of form draws you to the front door. This home's small front yard uses a water feature and creatively spaced pavers to create a contemporary look. If your grass is exposed to the sun all day and you're not getting much rain- grab a sprinkler! 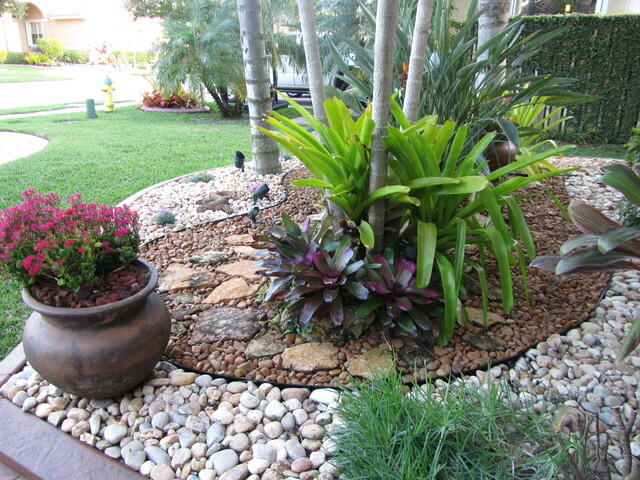 Create a beautiful front yard with a rock garden display. Group colorful plants in a single pot to enhance your front yard. Using simple stones, square shapes and cement you can create a modern paved landscape. Tie in different elements when designing your paved walking area. Add a splash of color by using big glazed pots. Using cement to make your raised beds looks sleek, simple and clean. Corrugated metal roofing or steel siding creates a stylish raised bed. A front yard water feature displaces street noise. A clever water feature in your entry that doesn't collect water in a basin. This modern water feature in copper lends the front yard a zen vibe. Subtle touches of color create a unique front yard. Personalize builder-grade pavers by adding river rocks in the seams. Add a rock garden for a zen look to your front yard. A raised bed adds appeal to your front yard. The lush, green lawn of this home's front yard begs for a visit. The front yard is typically the first thing that people see when they visit a home, and its appearance sets the tone for the rest of the house. While backyards are often given more attention, using some of the following front yard landscaping ideas will help you create a usable and enjoyable space. The front yard’s curb appeal can be a major factor in your home’s resale value so improving the landscaping not only makes your home look more attractive, but it’s also a solid investment. Keep the design simple and focus on a few simple solutions to add character and structure to the space. Here are some front yard landscaping ideas for boosting curb appeal and making your front yard look more attractive. A lush green lawn is quintessential to a front yard that looks fresh and polished. However, some areas of the country get little rain or may have water restrictions during certain times of the year so watering a lawn to keep it green might not be an option. If you are considering starting a new lawn or sprucing up your front yard by spreading new seed, choose a grass that is suitable to your local climate. If you live in an area of low rainfall, choose a drought-resistant variety such as Zoysia, Bermuda or Buffalo grass. A rock garden is a beautiful addition to a front lawn, particularly in dry regions where many plants may struggle. Choose rocks that look as if they are part of a natural, rocky landscape and will complement the vegetation. For example, if creating a woodland rock garden, use mossy rocks and boulders of gray in assorted sizes along with low-growing wildflowers, such as ferns and trilliums. Multi-level rock gardens are particularly effective, as they draw the eye up from the ground and add visual interest. Unique hardscaping is one of a few important front yard landscaping ideas to incorporate. 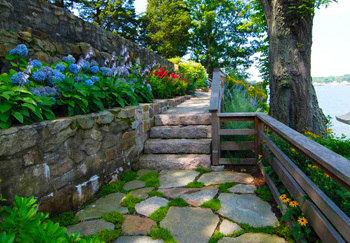 Add a visual element to your outdoor space by adding a rock or concrete path. Large slates or irregularly shaped stones can help create a natural looking path from the sidewalk to your front door, and will had functionality to your yard. When planning paths, consider how people naturally move through the space and design your paths to follow the foot traffic. Plant a few brightly colored flowers and shrubs in big glazed colored pots to add a splash of color to your front yard. Not only are they less labor-intensive than tending to your in-ground plants, they can also help brighten up the darker corners of your yard by providing a colorful visual composition. The pots also prevents invasive plants, such as mint or ivy, from taking over your flowers and plants. Rows of raised beds are an easy way to add a personal touch to your front yard. You can create raised beds from all kinds of materials, from wood to garden timbers. Raised beds also provide a great opportunity to grow plants that are not suited to your yard’s soil type since you can fill them with whatever kind of soil you need. For example, flowering plants that need acidic soil, such as begonia or trillium, are often successfully grown in raised beds, even if the surrounding ground has a high concentration of lime, which isn’t conducive for growing these types of plants.